Ray Maynard. M60 Joss Naylor Challenge, 20th May 2017. 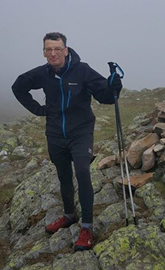 It all started about 20 years ago after I had completed the Bob Graham Round, people asking “what next?” I had heard about the Joss Naylor Challenge of course, but… I was 10 years too young so it was pencilled in for when I was fifty, however, due to continuous running related injuries I was unable to do it then. Fast forward to 2017, my 60th year. Finishing work gave me more flexibility and allowed me to manage my training more effectively. So it looked like it was on. With the training getting done without too many setbacks I set the date and started to assemble the team. My family were all very keen to be involved as well as my running friends from Sunderland Strollers. 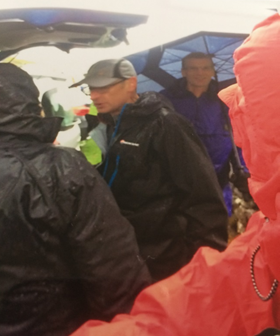 A few other generous folk, who were familiar with the route were also drafted in – thanks Ken. Following the 18 hour schedule the aim was to do the first two legs, at or just ahead of time and if I felt OK to push on a little. And so it was. After a brief photo shoot on the bridge we set off at exactly 5.00am. Mal, Steve, Sally, Max the spaniel and myself. Mal missing the turning straight after the bridge – well he did say he didn’t want to navigate! The weather was dry and bright, which was better than the forecast indicated, but we could see clouds shrouding the tops beyond Ullswater. I had recced part of this section during the week before in very strong winds and heavy rain, thinking if the weather’s like this it will be nigh on impossible to get round. Good progress was made and the first few tops as far as Raven Howe were ticked off more or less on schedule. Climbing up to High Raise we encountered cloud, but visibility wasn’t too bad at this point. As we progressed though the weather deteriorated. Between Thornthwaite Beacon and Stoney Cove Pike we got separated and had to shout to keep in touch. Just after the summit heavy rain and hail came in so it was waterproofs on. 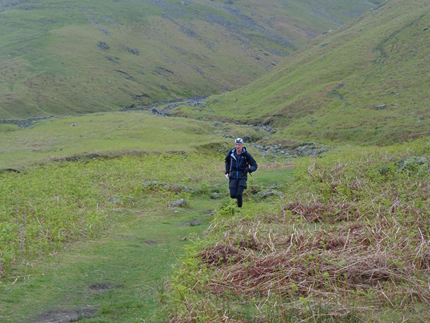 We made decent time to Pike Howe and Kirkstone after that, being 26 minutes up. The crew – Maria, Lauren & Karen were there in the rain to meet us along with Carly, Sean and Molly the cockerpoo – the ‘official’ photographers. They had setup earlier but had to dismantle it all when the wind and rain came in, then one mad dash to set up again as we emerged almost unseen out of the mist and lashing rain. Porridge and coffee were enjoyed, I had been looking forward to that all morning. After some clothing adjustments we were ready for the off when someone tipped the umbrella I was under, pouring water down the back of my neck – thanks Ken. 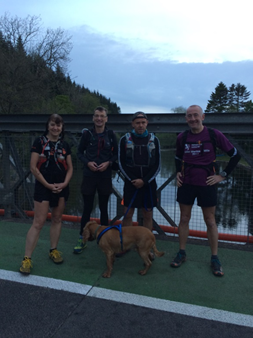 Mal, Sally and Max were leaving us at this point, being replaced by Matt who had had to do some last minute hill training (not easy in London) for the event and Paddy who is getting the miles in prior to doing the Lakeland 50 in July. The rain was easing off as we went up Red Screes at the start of this short but relatively tough leg. It was misty again higher up and we had to be careful with the navigation. We took some good lines and kept ahead of schedule. In the Fairfield area there was an organised walk in full swing with lots of participants all over the place. Some moving quite well, others struggling and being assisted by their colleagues. Over Seat Sandal and down the steep descent to Dunmail Raise I was able to push on a little, getting to the road 48 minutes up. The crew were there to feed and water us. 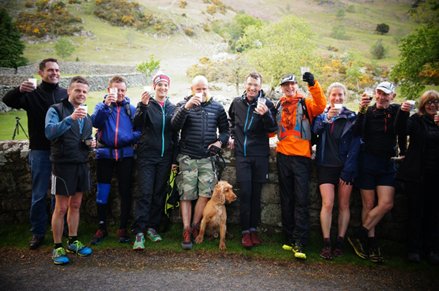 The layby was really busy – obviously something else going on, it turned out to be a BGR attempt by the USA’s Meghan Hicks. Pork pies and soup were on the menu here, then a quick change of shoes for the rocky ground ahead. Steve, Matt and Paddy had all done their bit and were replaced by Ken, Dale, Chris and Ashleigh. This is the leg where I was going to push on if I felt up to it and that’s what we did. It was slow going up Steel Fell but with Dale knowing the best lines we made good progress thereafter. Going towards Rossett Pike we were running alongside competitors on the Old Counties Tops Race. A good route up Bowfell followed and the next couple of tops were ticked off comfortably. Ken and myself descended Great End quickly arriving at Sty Head 2hrs 10 minutes up. A different support crew here, Bob and Malcolm had come up from the valley with supplies of food and drink and they were getting cold waiting about so they were glad to see us and get on their way. Chris returned to Borrowdale with them. Paul and Jenna who were running the last leg, had started up Great Gable before we arrived, again because of the cold. We expected to meet up with them on the summit but there was no sign of them in the mist so we pushed on quickly down the scree to Beck Head, Dale cutting his hand on the descent. Jenna and Paul were on their way up Kirkfell in the distance, then they disappeared into the mist, thankfully we all met up near the summit. Paul and I had recced this leg previously and had descended by the ‘path’ following the fence line, which was not very pleasant. So we used Red Gully as an alternative, which I had forgotten about and not used since my BGR attempt. Descending Red Gully my knees started to give me bother so the going was a lot slower than I would have liked. Once at the col I got my walking poles out and was fed some pain killers. It was slow going to the top but we got there in the end and then on to Scoat Fell. Jenna came to steeple with me – another Wainwright for her, while the others got a bit of a rest watching us go out and back. Haycock was done, but after that I was really struggling with my knees on the steep descents where I would normally expect to get down quickly (the annoying thing is that the injuries I had been having have been in my calves not my knees). It did not feel like it at the time but we were still chipping away at the scheduled times. Neil was waiting for us with tea and food on the climb up Seatallan, a very welcome sight and an excuse for a short break. Onwards and upwards again to the top. Just one more to go. Down into the col and then the climb up to Middle Fell, the last one; bagged it! Now for the ‘easy’ run down to Greendale Bridge. Ken and Dale ahead, Paul with me, and the others following on we made slow progress due to my knees. A run into the finish to a brilliant welcoming committee of family and friends. I would like to take this opportunity to say a huge thank you to each and every one of you, without your help and support it wouldn’t have happened. Route completed in 15 hours 14 minutes. No sign of Joss at the finish though – he was attending a presentation in Windermere, not to worry though, hopefully I will get to shake his hand at the presentation and thank him for a great day out. I would also like to thank those people who encouraged and supported me, but were not present at the weekend (including Jim and Charlotte who were there, but I didn’t see them). And thanks very much to all who donated sponsor money – we raised £450 for the Alzheimers Society. Nice one Ray. It was a joy to be part of it all apart from Malcolm’s snoring. Cheers Paul. You were a massive part of all of it. Can’t take responsibility for Malcolms snoring though.